Credit card rental car insurance can save you a truckload of money. You won’t have to buy supplemental insurance from the rental company, for one thing. And even more importantly, it covers you in the event of damage to or theft of a rental car. Coverage up to the cash value of your rental vehicle is typical. But the best credit card rental car insurance policies give you up to $75,000. The problem is that just 47% of people even know about credit card car rental insurance. And one-third of credit card users don’t know if their card has it. That’s an issue because you must decline a rental company’s supplemental insurance for your credit card’s coverage to work. And you can’t know to do that unless you’re familiar with how your card’s policy works. Credit card rental car insurance policies are driven by three of the four major card networks: Visa, Mastercard and American Express. The other major card network, Discover, stopped offering its rental car insurance benefit in March 2018. But individual credit card companies determine the specifics of the coverage that customers receive. 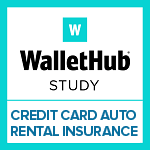 So to help you maximize your savings and security, WalletHub compared each major credit card company’s rental car insurance policy. Based on this analysis, we then selected the best credit cards for rental car insurance, out of 64 total offers. You can find the results below. Offers are accurate as of June 20, 2018, and many are likely to have changed since. 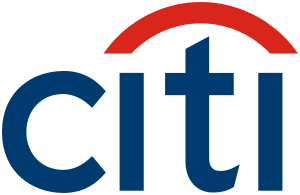 Best Issuer: Citi is the best credit card company for rental car insurance, covering cardholders for up to $75K and 31 days. Avoid Renting: A truck, open-bed vehicle, exotic/antique car, large van or full-size SUV if you want credit card rental car insurance coverage (usually excluded). Coverage Duration: More than 38% of cards only cover domestic rentals for up to 15 days. Road Conditions: 16% of credit card rental car insurance policies won’t cover damage that occurs while driving on a dirt/gravel road. Country Coverage: All Citi and Chase cards provide global coverage. Ireland, Israel and Jamaica are the most common exclusions among other issuers. Tire & Rim Damage: More than 1 in 3 cards do not cover all rim/tire damage. 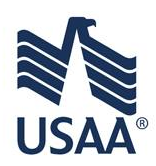 Loss-Of-Use Losses: More than 86% cards will reimburse you for loss of use, which can cost over $100. Business credit cards seem to offer similar benefits. However, business cards seem to have policy details slightly enhanced (e.g. covering 31 days instead of 15 days rentals) and a few cards even offer the policy as primary coverage instead of secondary. We recommend taking the following steps to minimize the cost and liability associated with renting a car. Be safe out there! Call your insurance company to see if rentals are covered under your standard policy. Older policies may not offer this coverage. Call your credit card company to ask if any limitations apply to your card’s coverage, relative to your rental plans. Double-check with long-term rentals. They might not be covered by your auto insurance policy, due to time limits. Decide whether to mix business with pleasure. Your personal auto policy – if it even covers rentals – only applies when the vehicle is used for personal use. So if you’re traveling for business check what other options are available for you. Get a rental like your everyday ride. Your personal auto insurance is more likely to cover your rental if you get a vehicle of similar value to your own car. Ask about adding an insurance rider (for a small fee) if your policy doesn’t cover a certain type of rental car. Consider a non-owner auto insurance policy if you don’t have a car but drive from time to time. Make a plan before you hit the rental counter. You may want to accept a rental company’s liability insurance and collision damage waiver if you don’t have personal auto insurance and your credit card won’t give you enough coverage. In any case, you want to make an informed decision, not one based on panic at check-out. Credit-card rental car insurance policies were previously evaluated at the network level, but we decided to examine coverage at the card level in 2016 after discovering discrepancies among offers on the same network and/or issued by the same company. Where no policy differences existed, cards were grouped by issuer or network for the sake of simplicity. *Policy will be in effect after July 29, 2018. WalletHub reviewed the publicly available online car rental policies of all the credit cards currently being offered by the 10 largest issuers, excluding student and co-branded offers, and collected the information needed to answer the following questions: 1) What vehicles are excluded? ; 2) What other exclusions do the policies have? ; 3) What is the quality of the coverage? ; 4) How does one activate the benefit? ; 5) How should claims be filed? ; and 6) How easy it is to obtain complete policy information? Where policies were unclear, we contacted the issuers directly and requested clarification. All issuers responded to our questions and confirmed the accuracy of our data. The card with the most accumulated points received the highest score. The maximum number of points is 100%. I am currently waiting (over 60 days) for Hertz to provide American Express with the information they need to process a claim I filed using my American Express Premium credit card protection. I am nervous that Hertz is going to suddenly charge my card - and I would like to cancel the card. As the card was valid and in force at the time of the accident and I paid the rental in full when I returned the car - it seems logical to me that my cancelling the card now should have no bearing on their continuing to process the claim. Can someone verify this for me?